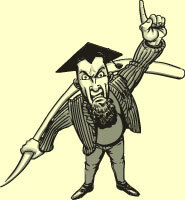 Each year’s Great Reading Adventure aims to encourage people of all ages to learn something new – about a particular author or genre of writing, about events from history, about contemporary issues of debate. Wherever possible a direct link is made to the life of Bristol. The 2008 Great Reading Adventure and The Bristol Story presents an opportunity to have fun while learning about Bristol’s past. It contains hundreds of fascinating (and mostly true) facts about executions, battles, maps, diseases, explorers, pirates, riots, sewage… and much more. All schools in Bristol have been invited to take part in the project and over 60 have signed up to join in. They have each received free copies of The Bristol Story and the comic for younger/emergent readers along with the illustrated guide – which provides further historical information about the city – and display material. Activity sheets for use in group work in the classroom or by individuals at home can be downloaded here. These include quizzes, wordsearches and other puzzles, suggestions for writing and artwork, and research challenges. 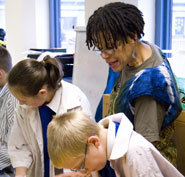 Since the autumn, Bristol Cultural Development Partnership has been running free creative workshops in selected schools and colleges as part of the Portrait of a Nation initiative for young people. Click on the links at the side to find out about the artists leading the workshops and to see some of the work produced so far. More examples of work and photos of the participants are in the Portrait of a Nation section. We hope that others will be inspired to make their own artwork, comic books, writing and drama pieces about their part of Bristol from seeing what these young people have achieved so far. We will display more examples of work produced in Portrait of a Nation and during the Great Reading Adventure on this website over the coming weeks. See also the News and Press page. 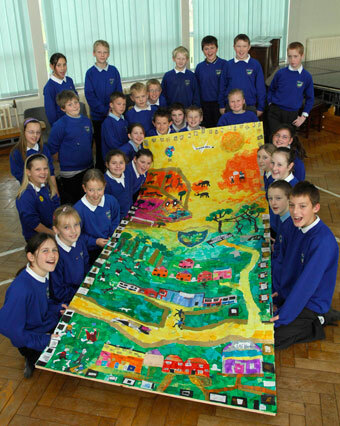 Pupils at Fair Furlong Primary with their Portrait of a Nation collage (Martin Chainey). 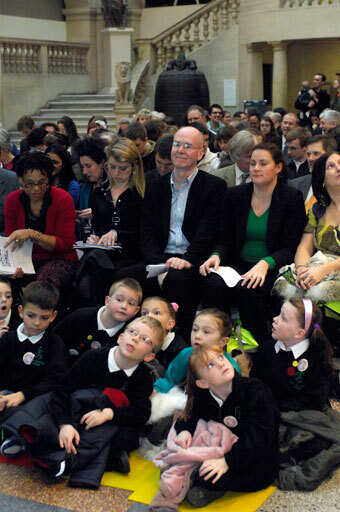 Pupils from Fair Furlong attended the launch event at Bristol's City Museum and Art Gallery (Martin Chainey). 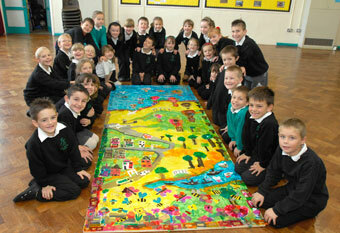 Pupils at New Oak Primary with their Portrait of a Nation collage (Martin Chainey). 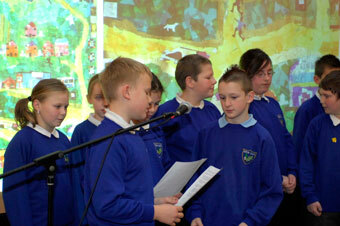 Pupils from New Oak told the audience at the launch event how they created their collage (Martin Chainey). on-line feedback received from schools about the Great Reading Adventure 2008 here. Visit this Bristol reading project's website here. 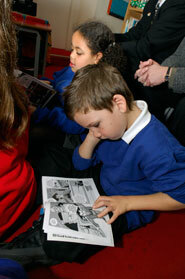 Readers at St George's Primary on launch day (Martin Chainey). We are delighted that so many scouts and guides are joining in the Great Reading Adventure. Here is Maureen Waller from the Brunel Scout District with the Lord Mayor of Bristol on launch day. The photograph was taken by her colleague Roy Harvey. Portrait of a Nation banner workshop at New Oak (Vicky Washington). Portrait of a Nation writing workshop at Fair Furlong (Vicky Washington). Portrait of a Nation comic workshop at Avon Primary (Dympna Leonard). Portrait of a Nation drama workshop at Avon Primary (Martin Chainey).